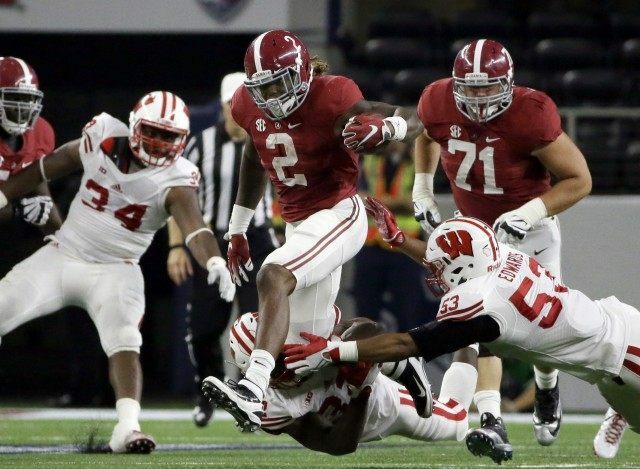 University of Alabama running back Derrick Henry won the Heisman Trophy at ceremony at the Downtown Athletic Club in New York on Saturday night. Henry rushed for 1,986 rushing yards and 23 touchdowns this season. His Crimson Tide play on New Year’s Day for a chance to compete for the national championship on January 11. Henry became just the second Crimson Tide player to win the prestigious award and the first running back to win the award since fellow Alabama player Mark Ingram won the Heisman six years ago with a plurality of ballots in the closest vote in history. Henry won the award with 1,832 points. Stanford quarterback Christian McCaffrey placed with 1,539 points. Clemson quarterback Deshaun Watson’s 1,165 points put him in third. Oklahoma Sooners QB Baker Mayfield came in fourth and Midshipman QB Keenan Reynolds rounded out the top five.